Still Water blog · Who will be heard when we wire the wilderness? Who will be heard when we wire the wilderness? How can rural economies and ecologies benefit from wired citizens? Still Water Fellow Miigam’agan and co-director Joline Blais tackle the subject along with New Media colleague Bill Kuykendall at two conferences organized by Maine Rural Partners and Portland Maine Permaculture. Maine Rural Partners is a non-profit organization based in Orono, Maine that is dedicated to advancing collaborative, integrated approaches to rural development. Bill Kuykendall and Joline Blais of the University of Maine’s New Media Department discussed citizen media makers and the use of media to engage people with their own community. Kuykendall, a member of the Maine Press Association board, called for a collaborative approach among professional and citizen media-makers to bring relevant news to the fore and stimulate community conversations about important issues. [Still Water Research Fellow] Miigam’agan, a member of the Mi’kmaq Nation, discussed her focus on ensuring that the voice of Maine’s indigenous people is heard in a culture of advanced technology. Blais also participates in the Portland Winter Gathering for permaculture designers and teachers at the New Forest Institute on 10 December. Like the 2011 ESTIA conference, this workshop follows the Open Space protocol–a governance model derived from open-source software development. 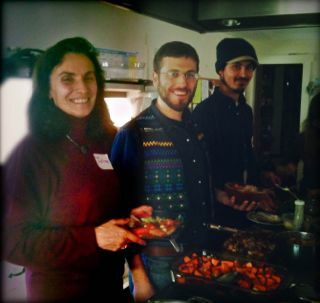 This will be an intense and rewarding day of connecting, sharing and “going deep” into the promise of what permaculture can be in our own lives and how it can be of service to all of Maine and beyond. This event will be convened in Open Space, a technique that presents an over-arching theme or question and empowers the attendees not only to create their own agenda for the day, but drive the outcome and experience as they see fit. 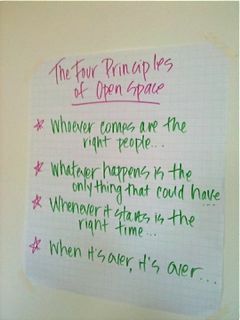 In Open Space, facilitators help open, hold and close the space with just the right amount of structure so that all the work that happens in between is truly by, of and for those who show up. Proceedings from the day are captured live and published that very day.